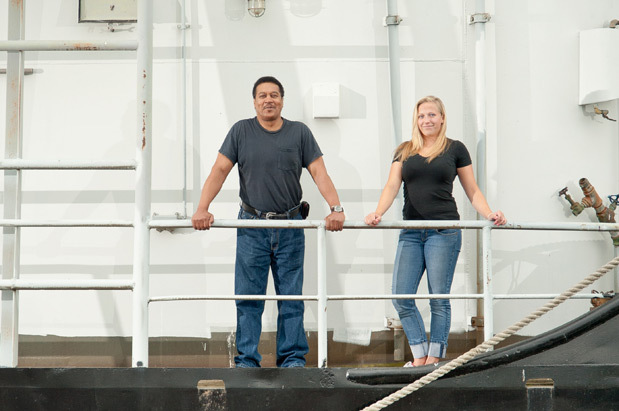 Madison Young and Larry Johnson represent opposite ends of the employment timeline—and both are exactly what the maritime industry needs. 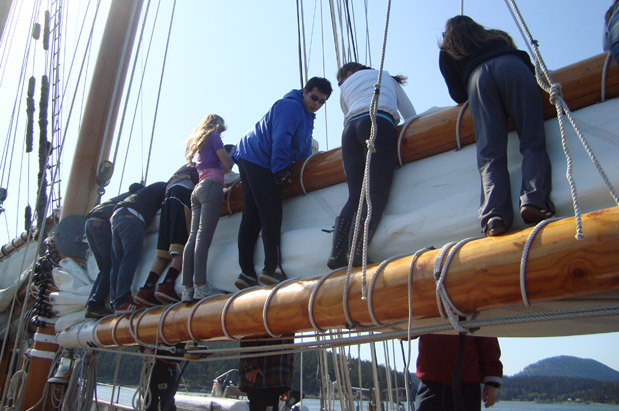 Young is 18 years old and newly graduated from Ballard Maritime Academy, a program at Ballard High School that introduces youth to maritime work on the water and on shore. Young discovered the possibility of a maritime career while a sophomore, and she plans to enroll in the six-quarter marine carpentry program at Seattle Central Community College (SCCC) this fall. Most of her peers have gone on to four-year colleges, and some of her family members don’t understand her choice. “[But] I wanted to work at something that I enjoy doing every day,” she says. She’s already taken the first step: building a wooden stand-up paddleboard. Johnson is 61 years old. But he’s not thinking of retirement. Arriving in Seattle from Wichita, Kansas, in 1977, he spent 20 years in the local shipbuilding industry. During the early 1990s, a slowdown in the industry and a non-work-related injury forced him out of the maritime world. But the combination of a strong work ethic—“I’ve been working since I was 15 years old”—and a lifetime of taking good care of his body—“Most people think I’m maybe 30 or 40 years old”—left open the possibility of returning to a maritime field. Then he learned about a Seattle nonprofit called The Anchor Program, which introduces men and women to a life at sea. In Johnson’s case, he needed help navigating the labyrinthine path for getting the required credentials to work with a ship’s engines and other machinery. With his papers now in hand, he has more options. “I can work as long as I want, as long as I can pass the physical,” he says. The maritime industry is glad to have Young and Johnson. It’s desperate to find more like them because the labor supply outlook in the maritime sector is grim, despite its huge presence in the local economy. The seaport half of the Port of Seattle (the other half is Sea-Tac Airport) supports more than 21,000 direct jobs, which include everything from ship repair to provisioning fishing boats to loading and unloading container vessels. In Pierce County, the number of on-the-water and onshore maritime jobs tied to the Port of Tacoma is 7,359. Both agencies are competing to bring in more container ship traffic, increasing the demand for qualified workers. According to the Workforce Development Council of Seattle–King County, regional employment in water transportation is projected to grow faster than the average for all occupations. Meanwhile, the group says, the average age for marine chief engineers is rising; in 2009, it was 50 years old, which means many of the most qualified workers will soon retire. In King County, there aren’t enough seamen and marine oilers to meet the needs projected for 2014 through 2019, and the number of captains, mates and pilots is also fewer than required. These are good jobs, many of them unionized with a full range of benefits. The median wage for a seaman in 2010 was $47,900 a year; it was $83,000 a year for captains and similar licensed professionals. Some marine sectors are particularly pinched. The domestic tugboat business, relatively unregulated in past years compared to cargo and passenger vessels, is facing a massive shift. This year, the United States Coast Guard began tougher inspections of tugs and towboats in response to a 2008 collision and oil spill near New Orleans involving an improperly licensed captain. Inspectors may find that some tugboat company employees don’t have adequate licensing and other credentials, forcing operators to improve training. In addition, the United States has signed on to an international treaty that calls for stricter licensing, training and manning in the tugboat sector. Charles Costanzo, vice president for the Pacific region of American Waterways Operators, which watches out for tugboat and towboat owners, says regulations calling for stricter licensing requirements could actually compel operators to compromise safety. “Recently, an engineer with years of experience was nearly forced by the Coast Guard to be relieved by one with a license but virtually no experience,” Costanzo notes, adding that there isn’t enough training capacity to meet potential demand. “Because the regulations haven’t required licensed engineers [in the past], there hasn’t been a path to obtain a license,” he says. That path, particularly for men and women who want to work on boats, has grown increasingly tortuous and difficult. For thousands of years, training on ships began when a teenager (invariably a boy) joined a ship as an apprentice mariner. Over time, he would “come up through the hawsepipe,” rising with hands-on experience eventually to captain. (The hawsepipe is the tube through which the anchor chain is connected to the deck. On large sailing ships, it passed near the deckhands’ quarters.) As ships grew more complex and marine traffic prospered, governments toughened licensing requirements, particularly after major disasters involving loss of life, such as the sinking of the Titanic and, in recent decades, major environmental mishaps, such as the BP oil spill in the Gulf of Mexico. Furthermore, after the attacks of September 11, 2001, security experts perceived American ports as a weakness, and governments tightened background checks. In the 21st century, maritime workers must carry new kinds of identity documents, as well as licenses and endorsements and union cards. They must also have no criminal records and have sufficient “sea time,” that is, practical experience on the water. They’re required to renew these credentials every few years or risk losing access to work. As the complexity of maritime work has grown, so has a cottage industry of schools to meet the demand for training. They range from four-year institutions, such as the U.S. Merchant Marine Academy in Kings Point, New York, to specialized facilities, such as the Pacific Maritime Institute (PMI) in Seattle. Now merged with the Maritime Institute of Technology & Graduate Studies in Baltimore, PMI has gained a reputation as a high-tech training center with full-scale ship simulation facilities rivaling those used by airline pilots. Gregg Trunnell, PMI’s director, says the 40-year-old school expanded in the late 1990s to address the growing need for licensed masters, mates, pilots, and other trained workers in command positions. He is now working with the U.S. Department of Transportation and industry partners to ramp up training for engineers. There’s room for on-the-job training as well as virtual experience: “The traditional hawsepipe is still valuable,” he says. 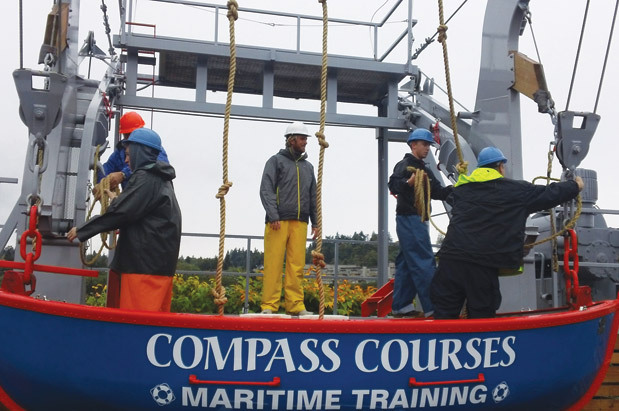 One of many schools dedicated to maritime education is Compass Courses in Edmonds, where more than 12,000 mariners have been trained. Students are also looking hard at costs. The growing burden of student debt has raised questions about the economic value of college if it takes decades to pay off the loans. Young’s boatbuilding program at SCCC will cost about $10,000, a fraction of four-year college tuition. Carl Ellis, who runs the 41-year-old Seattle Maritime Academy, a separate program at SCCC, is adding 30,000 square feet to his Ballard facility, essentially doubling its capacity when it opens in 2013 at a cost of $18 million. He says 90 to 95 percent of his students graduate into jobs paying $55,000 to $60,000 a year. When it comes to return on investment, he likes to cite the case of the engineers who maintain refrigeration units on ships, which are critical in the fishing industry and overseas transportation of produce. After paying the $6,500 tuition and fees at his school, these workers can make as much as $15,000 a month, earning back the cost of training in as little as two weeks.